Nutritional yeast, which is available in health food stores, is different than the yeast used to bake bread or brewer’s yeast. It is used as a supplement in smoothies, gravies, soups and casseroles or is combined with nuts to make a raw “cheese.” Its cheesy flavor makes it a tasty addition to popcorn and salads. 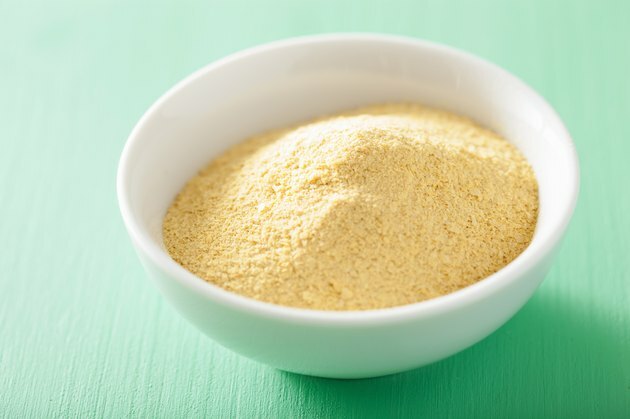 According to Sundance Natural Foods, nutritional yeast provides 18 amino acids and is a complete protein. It is also rich in B-vitamins, making it a healthy addition to vegetarian diets. Store nutritional yeast properly to preserve its quality and nutritional value. Purchase nutritional yeast flakes in bulk from your local health food store or from an online resource. Choose flakes over granules as they have a milder flavor and smoother texture. Put the yeast flakes in an airtight container. Use a glass jar, a sealed plastic container with a lid, or a sturdy freezer bag with a zip closure. Put the container in a dark space like the pantry or a cupboard. Keep away from pets. Sarma Melngailis and Matthew Kenney in “Raw Food, Real World” note that cats tend to be attracted to it and can rip open bags and containers of the product. Store it for up to a year. Registered dietitian Elizabeth Brown notes in the April 25, 2009 issue of the "Santa Monica Daily Press" that nutritional yeast may be enjoyed by those sensitive to the yeast used in bread or beer because it is deactivated and free of Candida albicans. The fortified type of nutritional yeast may be best for vegetarians, because it offers more of the B vitamins usually found in animal products. Use nutritional yeast to add a savory taste to raw preparations like dehydrated crackers.